●The specially made soup used the circle chicken soup stock abundantly and finished it with a taste of the soy sauce using the soybean which I did not genetically modify and the taste of vegetables. The fragrance of fragrant sesame and the leek which I greatly carved with patronizes the soup which fully drew the taste of the chicken still more without using a chemical seasoning. ・"Prawns" produce the products including "a crab" "a peanut" "milk" "an egg" "a side" in this article manufacturing facility. 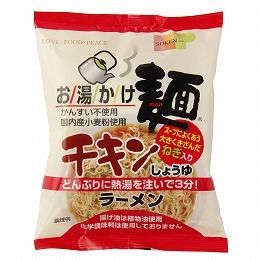 ・I use the dextrin to solubilize soup in a food material made from starch.